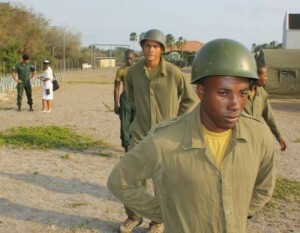 WILLEMSTAD - 67 boys started yesterday's military training for the Curaçao and Aruban Militia. For eleven months, they are trained at Parera's base to work as militiamen in Aruba and Curaçao. After that, they will be deployed for security and safety tasks. The militiamen are also increasingly involved in military assistance in the Caribbean and that is why they will be trained with the police and the Volunteers Corps (VKC). Four boys are trained as Officer of the Curaçao militia. They receive their training to a large extent in the Netherlands.